Isco was booed after making an angry gesture during Real Madrid's shock defeat to CSKA Moscow in midweek, but Santiago Solari does not believe it was aimed at the fans. The Spain international has played a bit-part role for Madrid since returning from acute appendicitis in October, with Solari yet to start the midfielder in a LaLiga match. Isco raised his arms and shouted when a miss in the surprise 3-0 Champions League loss to CSKA drew jeers from supporters. The 26-year-old also received criticism for appearing to refuse the captain's armband, although Marcelo clarified he wanted it to be given to the Brazilian's replacement Dani Carvajal instead. 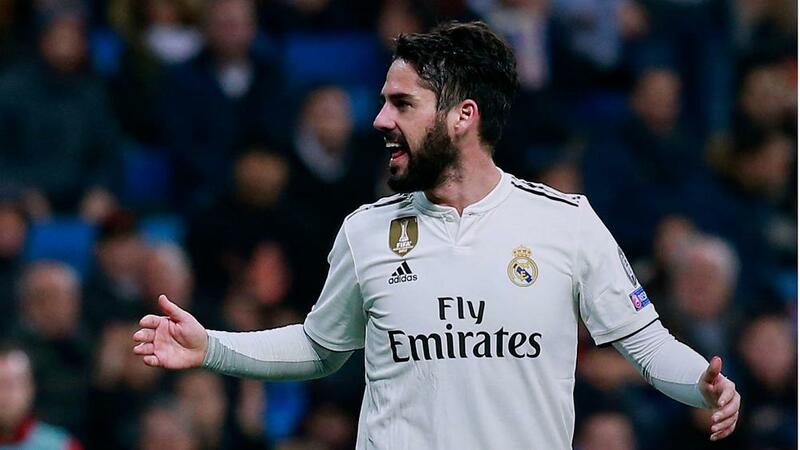 Solari said after the match he did not see Isco's gesture and he was keen not to place too much importance on it ahead of Saturday's meeting with Rayo Vallecano. "I got the impression he was claiming for a corner or a foul, I don't know," Solari told a news conference. "I understand the media's work, but ours must be something else. We are focused on playing Rayo Vallecano with the attitude shown in the vast majority of games. We have won eight out of 10 games and this is our path. "Isco is a mature man, a professional. He has given a lot of joy to this club and he will continue to do so. "The most unpleasant task of a coach is picking who plays, who is on the pitch and who is left out. "The fans express themselves, we respect that and we always seek their support. Everything that has been achieved in the club's 115-year history has been thanks to this unity and we hope on Saturday they will push us and encourage us."